What Are Four Nonliving Things in a Desert Ecosystem? Desert regions are far from exotic or rare, with deserts and semi-deserts constituting approximately 1/3 of the landmass of the Earth. 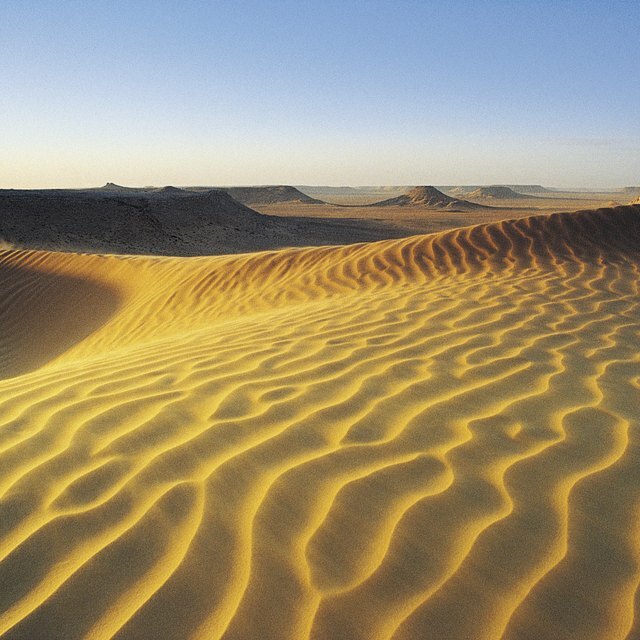 Roughly 20 percent of these desert regions are the vast, sandy areas that often come to mind when thinking about deserts, with many of the world's desert areas consisting of loose, highly mineralized soil. These harsh, arid environments spur on unique plant adaptations, as well as unusual landscape formations caused by desert-specific erosion phenomena. Alluvial fans are large fan-shaped piles of loose gravel, sand, silt and clay which occur on flat plains, at the base of narrow desert canyons and at the foot of desert mountain ranges. These fan-shaped masses are deposited as the flow of a river decreases in velocity, or dries up over a period of many years. Bajadas, Spanish for "descents" or "slopes," are broad, sloping surfaces of deposited material caused by the joining of individual alluvial fans in close proximity to each other. They are also found at the bases of narrow canyons and mountain ranges. One of the more aesthetically pleasing and unique characteristics of deserts is a natural biogeochemical phenomenon known as desert varnish. Desert varnish is a natural black or reddish brown coloring which occurs on desert rockface as a result of the biochemical interactions between microscopic bacteria and trace amounts of metals in the surrounding atmosphere, such as manganese and iron. These bacteria absorb tiny amounts of the metal from the air, and deposit it over the rock to which they've adhered. This extremely thin covering of atmospheric metals -- often about 1/100 of a millimeter thick -- not only colors the rockface, but serves to protect the bacteria from overexposure to the sun's heat. Complete formation of desert varnish is a process that takes thousands of years. The vegetation that grows in hot, arid desert climates is uniquely adapted to withstand harsh living and growing conditions. Specifically, the root systems of desert vegetation tend to extend much deeper into the ground than the root systems of native vegetation in more moderate and moist climates, in order to tap into the water table. 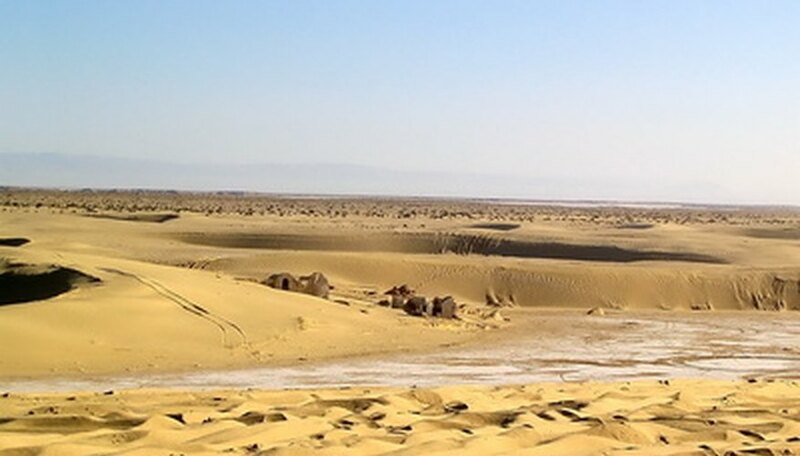 These deep root systems also serve to protect the desert landscape against excessive wind erosion by helping to anchor desert soil and sand in place. Desert plants are also adapted to store moisture in roots, leaves and stems for much longer periods of time than plants in moderate climates. Examples of arid environment plants, aside from the well-known cacti, include the pea family and sunflower family of vegetation. Ramirez, Juan. "Unique Features of Deserts." Sciencing, https://sciencing.com/unique-features-deserts-7593689.html. 24 April 2017.